There are many intriguing facts that the world of languages has to offer. From weird words to cultural exclusives, here are some interesting facts about the languages taught here at GA Institute. 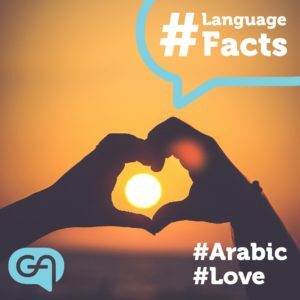 There are more than 10 words for ‘love in Arabic! The most common word for love in Arabic, ‘hubb’, comes from the same root as the word ‘seed’ that which can grow into something beautiful. Arabic is, after all, the language of poetry! 2. Studies suggest that people who speak Chinese will learn to use both temporal lobes of their brain, whereas English speakers will only use the left side. Both temporal lobes are required to distinguish between words that have different intonations in Mandarin. 3. The opposite of ‘sparkle’ is ‘darkle’. Check out our English courses here. 4. French is the only language besides English that’s spoken on all the continents. Much of west Africa is French speaking, Canada in North America, French Guiana in south America, Vanuatu in Oceania. 5. ‘Sobremesa’ is the Spanish term for after-dinner conversations. Check out our Spanish courses here. ← #LanguageFacts – Part Dos!